one part cotton-candy airiness, one part dense fudge, halva is a unique delicacy Tradition & technology The making of halva is a delicate process that employs both traditional techniques and top notch technologies to create its unique texture –one part cotton-candy airiness, one part dense fudge– and mouth-watering flavor –not exactly sweet and not savory either. Halva consists of two basic ingredients: tahini (sesame pulp) and some kind of sweetener, such as sugar, honey, glucose syrup, fructose or carob syrup. The ground sesame pulp is collected in special large bowls, while, at the same time, the sweetener is melted in high-tech syrup tanks until all humidity is evaporated, and the caramel is formed. Once ready, the caramel is then combined with the tahini and hand-mixed by master-craftsmen following the traditional recipe. Mixing the halva is a difficult kneading process, first because the temperature of the dough is around 80°C, and second because the quality of the final product relies on the deftness and patience of the artisan. 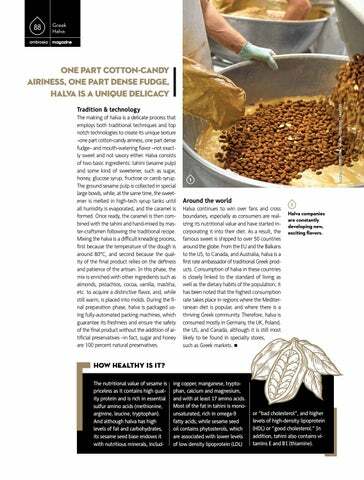 In this phase, the mix is enriched with other ingredients such as almonds, pistachios, cocoa, vanilla, mastiha, etc. to acquire a distinctive flavor, and, while still warm, is placed into molds. During the final preparation phase, halva is packaged using fully-automated packing machines, which guarantee its freshness and ensure the safety of the final product without the addition of artificial preservatives –in fact, sugar and honey are 100 percent natural preservatives. 1 Halva companies are constantly developing new, exciting flavors. or “bad cholesterol”, and higher levels of high-density lipoprotein (HDL) or “good cholesterol.” In addition, tahini also contains vitamins E and B1 (thiamine).